The IDEA Center at the University of Notre Dame surpassed its goal of creating 16 faculty and student startup companies in its first year by launching 27 companies between July 2017 and June 2018. Students from Notre Dame's Mendoza College of Business are involved in 11 of the ventures. That number nearly equals the total number of startups, 33, in the University’s entire 175-year history prior to 2017-18, and it exceeds by a wide margin the previous single-year record of three startups in 2016. To qualify as a startup, companies must be licensed as a business, have a business plan and management team, and have completed the IDEA Center’s “de-risking” process, which assesses innovative ideas for their market potential. Among the 27 startups are companies involved in health care, information technology, law and media. Collectively, the companies raised more than $4 million in investments or grants, created 83 new jobs, launched 23 products and generated more than $500,000 in sales. Thirty-one of the 55 startup company founders were Notre Dame students. The IDEA Center opened in early 2017 with a mission to find commercially viable, early-stage product ideas and innovations from Notre Dame faculty, staff and students and shepherd them to the marketplace. The IDEA Center has set a goal of creating 30 startups for fiscal year 2018-19 and plans to increase the number each year. Over time, the aim is to build an ecosystem of high-potential startups in the South Bend-Elkhart region that grow rapidly and then attract venture capital, entrepreneurs and an increasing number of startups that create more jobs, all in a virtuous cycle of economic development. 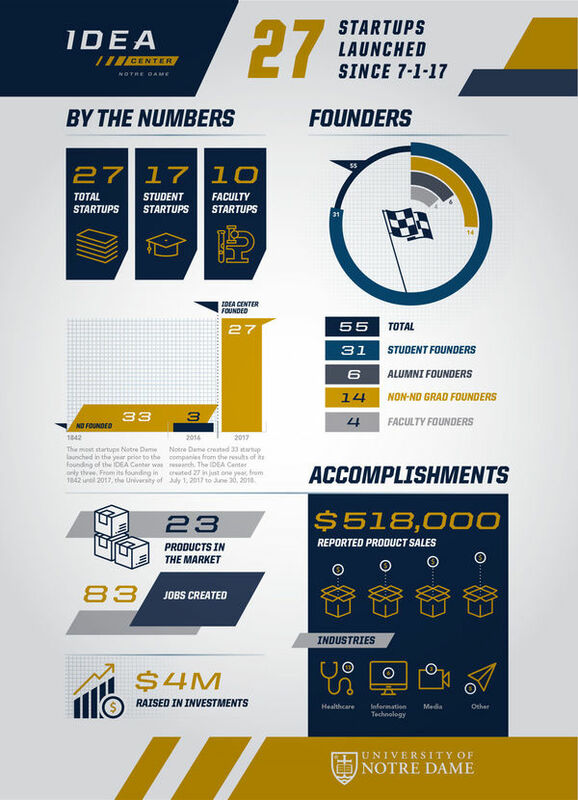 Standing for Innovation, Derisking and Enterprise Acceleration, the IDEA Center is the fundamental resource for all commercialization and entrepreneurial discoveries at the University of Notre Dame. Its goal is to translate staff and student discoveries, launch startup companies and leverage meaningful partnerships for social and commercial benefit. For more information about each of the 27 startups and the IDEA Center’s mission and economic vision for the future, visit https://ntrda.me/2L0U5tY. Originally published by Nick Swisher at news.nd.edu on July 16, 2018.